Discussion in 'Work in Progress' started by AlmyriganHero, Dec 29, 2018. After putting nearly three years of work into my previous project without even getting the first main dungeon and boss done, I've decided to simply cut my losses and concede that I bit off more than I could chew. Never one to give up though, I already have a new project in the works, titled The Great Frebbventure. On the surface, the premise of TGF is a fairly simple one. Frebb, a weird boneless cat man who lives in an abandoned castle, gets in how water with alien named Ulcethot, the self-proclaimed god of fun, for making fun of his parties and criticizing his lifestyle. The alien overlord considers both of these things acts of espionage, and evicts Frebb from his home. In order to get his fort back, Frebb must run, jump, and fight his way across 5 worlds with around 8 levels each, collecting dryly humorous contextual goal items and fighting bosses on his way to crash Ulcethot's party and force him to renew his land ownership deed. 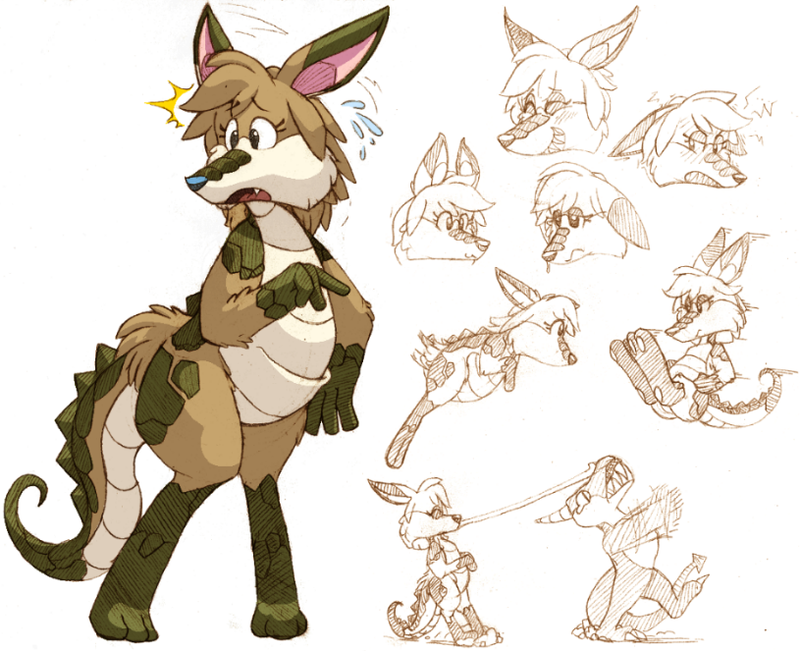 A few new friends will join him along the way, but otherwise, it's fairly simple and linear. That probably leaves you asking, "But what the heck is a 'perfect-a-thon'?" Basically, imagine the sorts of gating mechanics used in collectathons, but rather than having the collectibles be physical objects found within stages, they're instead awarded for beating said levels under certain stipulations. Each course has three medals to collect; one for beating the entire stage without taking damage, one for winning under a certain time limit, and a final one for reaching the goal with all 100 gems collected. You won't have to earn every medal in every stage to progress through the main campaign, but there will of course be bonus content awarded for 100% completion. Frebb, our brave...protagonist guy who's somewhere between a hero and an antihero. His moveset is simple but versatile, and his controls are tight but forgivingly floaty. Roxy, the first unlockable character, recruited at the beginning of world 2. She's the designated "power" character, running faster, jumping higher, and hitting harder than the others, in exchange for a weighty control scheme that takes a bit more skill to master. Siavellez, sitebender and Davide Miccolis like this. I really like the plot, seems very well thought out! Glad you like it, I honestly just sort of threw it together in a couple of drafts to try and make something quirky and different but narratively sensical. The first boss is complete! Technically, he's more of a miniboss, as you fight him after only the first two levels, but he puts up a pretty decent fight. Currently, the plan is for each world to have 2 miniboss stages like this which require a certain number of medals to challenge, and then one longer and more difficult battle at the end. Also, please try and forgive the audio quality. This is honestly the best that my cheapo laptop's speakers are capable of, and the game sounds much better through headphones. A look at the game's "lighting" system, as well as a tiny slice of world 1-3 in the lower screenshot. It's basically just a surface that blends two adjustable color gradients over the screen, and though it's simple, it gives some pretty vibrant results that add an extra bit of character to each stage and bump up the game's presentation by those few precious extra notches. Siavellez, mamacato and RichHopefulComposer like this. 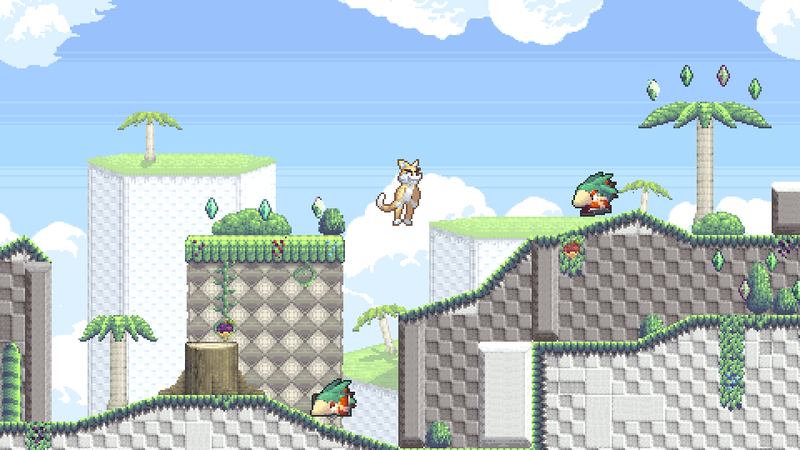 1-4 Took a bit more time to get underway, but that's because I had to make a brand new tileset and background. 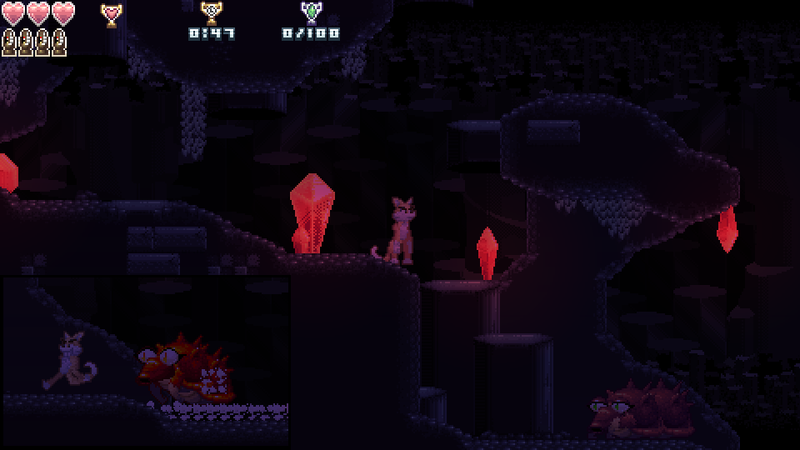 Isobear Lair is a pretty standard cave level, with the exception of its titular inhabitants. These big spiky bugs wander back and forth slowly and aimlessly, but don't be fooled! The moment you enter their line of sight, they'll go berserk and try to run you down; and probably succeed, as they're much faster than Frebb. Mind their movements, and stay above or behind them as much as possible. Another juicy new gameplay video, showing off World 1-5, Terrace Fortress. This is what I'd consider to be the first level where simply getting from the start to the goal is in itself a considerable challenge. It even features a very simple mid-level miniboss. Also shown are some additional moves for Frebb himself. They aren't necessarily things that make combat more complex or "deep," per say, they just give the player a few more options when moving and attacking. The slide kick, for example, still effects enemies in the same way as the spin attack, but instead of bouncing off of sturdier targets, you'll continue moving past them. 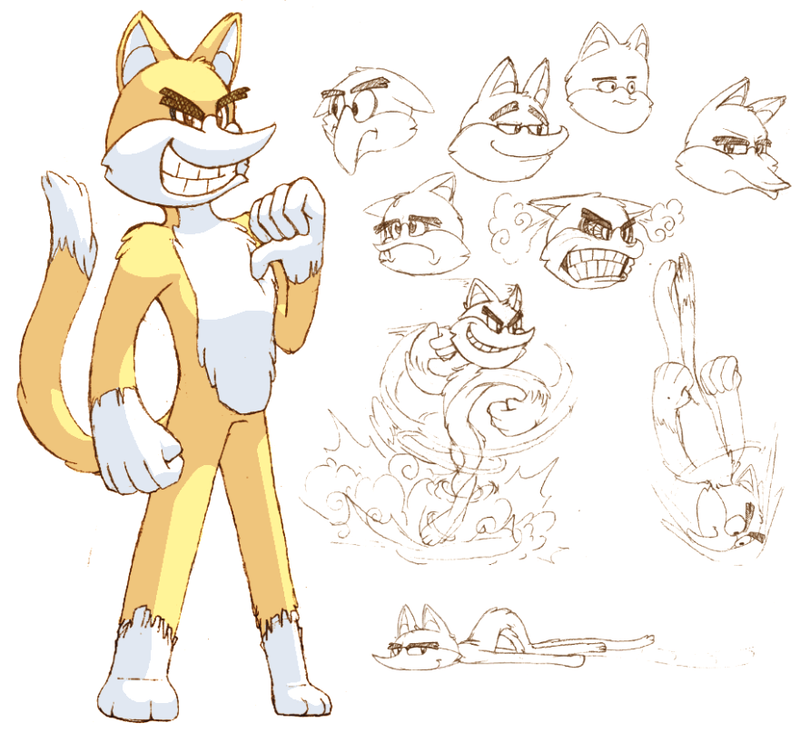 That's right, the second boss of Breezy Heights is complete. 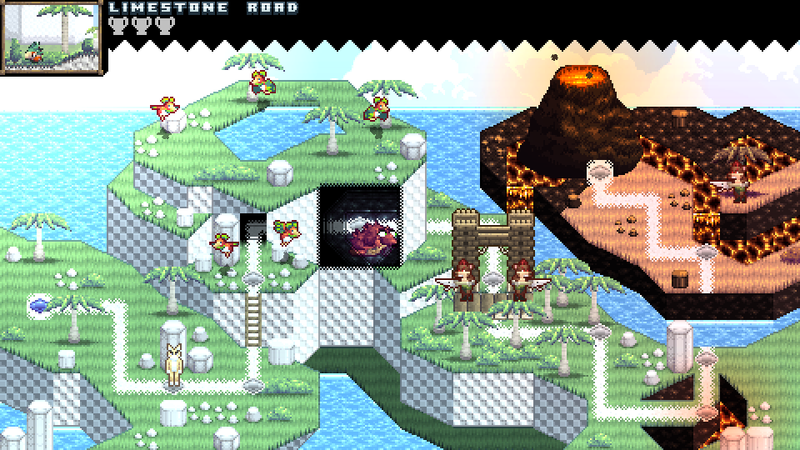 A couple more levels, a third boss, and a few simple post-level cutscenes, and world 1 will be finished! Then after I get the map screen and save systems up and running, I reckon I'll have enough content ready to release something playable to hopefully gather some feedback and drum up a bit of interest. In the latest exciting (but clearly not exciting enough given my depressing YouTube statistics) The Great Frebbventure update, our brave and handsome hero transcends the oppressive binary of fight OR flight and sticks it to the man by doing both simultaneously! Yes, it's a shmup level. The main feature on display here is the boost mechanic, which lets you control the speed at which the screen scrolls. It's not really helpful for actually clearing the stage itself, but it's good for a few thrills, and more importantly you'll need to use it to get the clock medal. Also I made yet another boss because I just can't help myself. Siavellez and mamacato like this. Well, here it is, the final level of World 1! It's actually been finished for a few days now, but I've been busy with slightly more metagame features like data structures, the systems that award and keep track of medals, and cinematics. Looks well polished! I like the music and the levels. The premise is fun. But that's a fox, not a cat. 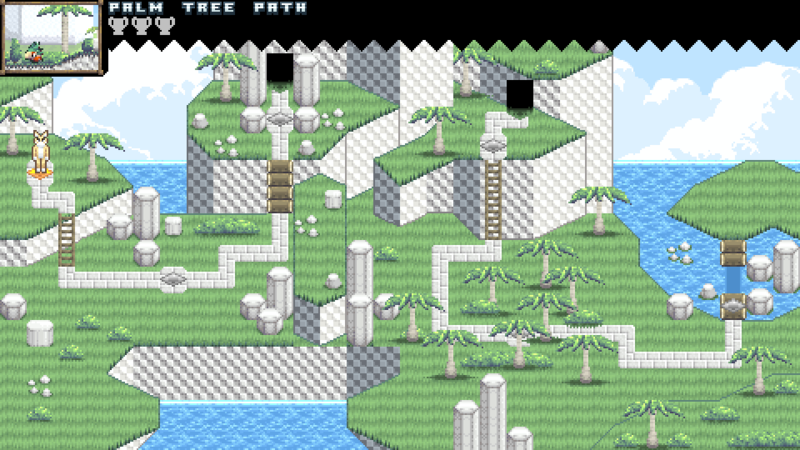 The overworld map is nice. But the level select areas are a little bland maybe. Did you plan on adding a bit more unique decor to differentiate one level select from another? in response I ask, would you remind me what animal banzoo kazooey (or wtv) is? Not gonna lie, I'm not quite seeing how Frebb looks more like a fox than a cat. I suppose he doesn't really look that much like a cat either, but what about him is explicitly vulpine? 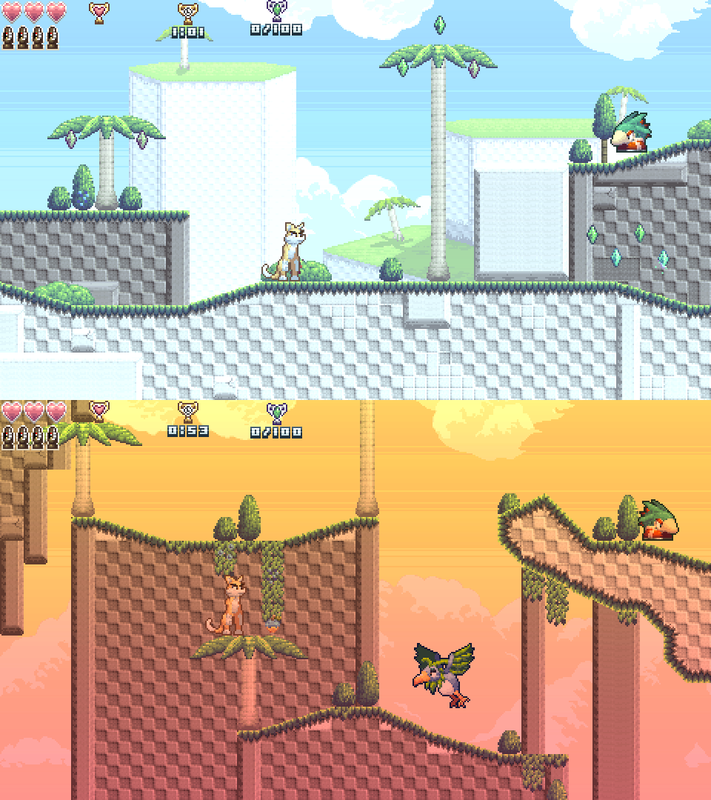 And I definitely plan on adding more details to the world map around the level spaces. Especially Terrace Fortress, the level entrance is just kind of sat in the middle of the big ladder right now. The entire world map is basically just a prototype, I'm going to be remaking it completely, though that may end up being the very last thing I do before the demo gets released. I don't understand what s the story behind this level. I mean who are those bad guys? There isn't really any sort of huge story behind it, fire-breathing pigs and other assorted monsters related to fire and lava are just some of the main recurring enemies in world 1. Unless you mean that you don't see how that's going to tie into the main story, in which case...well, not actually very directly. World 1 is Frebb's own home turf, and it's a pretty remote place, so it sort of has its own little self-contained story with a more minor villain who's just sort of under Ulcethot's influence. It isn't until partway through world 2 that Frebb starts getting into the thick of things with the big bad and his main minions. I might show off a bit of story-related stuff over the next week or so, but I'm going to save most of it for the world 1 demo.